Help us support TAMBA’s work supporting families with babies in neonatal care. Most expectant mums will progress through their pregnancy and birth smoothly, with baby delivered around about the 40-week mark at a healthy weight. It mostly happens relatively quickly and parents are dispatched home from the hospital in double quick time, wondering where to pick up the instruction manual for said baby. Sometimes, however, it doesn’t quite go like that. 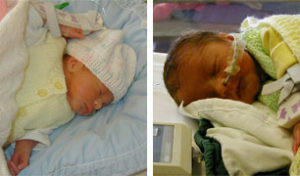 Each year in England alone, 54,000 babies are born prematurely, that’s nearly one in ten babies. Multiple pregnancies come with higher risks for both mother and babies with less than half, just 43%, carrying to full term. A high proportion of premature babies will spend time in neonatal care. It’s an experience which many parents are often unprepared for and one that can be very frightening. TAMBA (Twins and Multiples Births Association) is a charity that is very close to our hearts. I gave birth to twins who were born 10 weeks early and I had quite an adventure in the few days leading up to their birth. Fortunately, I am hopelessly optimistic so was convinced that all would end well. The most distressing part for me was the first night I had to leave my twins behind in SCBU (Special Care Baby Unit) and go home. It just didn’t feel right to be leaving babies behind; they are supposed to come home with you – that’s just how it’s meant to work. I just cried and cried completely irrationally and inconsolably. Fortunately, my girls were incredibly healthy at just over 3lbs so we were able to come home after seven weeks. Many people have a much tougher and longer journey on their way home, possibly with their babies in separate hospitals. Tamba’s Neo-Natal Guide has been produced in conjunction with Bliss (the special care baby charity) and is there to support all families with a baby in neonatal care. We’re supporting Tamba’s work in this area because every penny raised plays a vital role in helping families through what can be a very difficult and emotional time. Find out more about Tamba. £100 – pays for 20 expectant mums to attend a class to prepare them for their babies being in neonatal care. £500 – pays for 30 families to receive intensive support by phone. £1,000 – pays for detailed advice and campaigns to stop families from being split up across different hospitals. £3,000 – pays for us to provide free booklets to 5,000 families with one or more of their babies in intensive care. £9,000 – pays for in-depth research into the needs of these families. For every online sale, Morrck will donate £1 to Tamba. So far we have raised in excess of £54,000! Please help us support families during their time in Special Care.